Gluten free pork and caramelised red onion sausages. 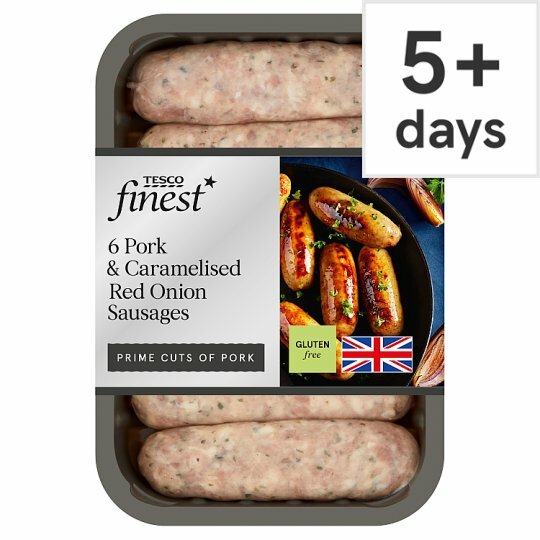 Our Tesco finest* sausages are made for us by a family run business who’ve taken pride in making sausages for more than forty years. They are all made with 100% British pork which is hand trimmed by expertly trained butchers. The sausages are then seasoned and other carefully selected, fresh ingredients are added to enhance the rich, succulent flavour. INGREDIENTS: Pork (74%), Caramelised Onion (15%), Water, Rice Flour, Salt, Stabiliser (Sodium Triphosphate), Onion Powder, Brown Sugar (Sulphites), Dextrose, Vegetable Fibre, Preservative (Sodium Metabisulphite), Parsley, Antioxidant (Ascorbic Acid), Emulsifier (Mono- and Di-Glycerides of Fatty Acids), Caramelised Sugar Syrup, Nutmeg Extract, Pepper Extract, Marjoram, Paprika Extract. Instructions: Oven 190°C/Fan 170°C/Gas 5 30-35 mins Place on a baking tray in the centre of a pre-heated oven for 30-35 minutes. Instructions: For best results grill. Place under a pre-heated grill for 20-25 minutes. Turn occasionally. Once defrosted use the same day and do not refreeze.